Build a LEGO® brick model of one of the world's most architecturally impressive and symbolically important structures. Located in Washington DC, the United States Capitol is a magnificent example of neoclassical architecture covering more than 1.5 million square feet and with over 600 rooms and miles of corridors. The building that we see today is the result of several major periods of construction that have taken place since President George Washington first laid the cornerstone on September 18, 1793. This meticulously detailed LEGO Architecture interpretation of the U.S. Capitol focusses on the structure's striking white, columned façade with its famous steps and lawns, and features a removable dome for access to a detailed interior depicting the famous National Statuary Hall, complete with columns, statues and tiled floor. Price is 34% below the initial Lego retail price, a € 37.00 discount! This comes down to 7.07 cent per brick. 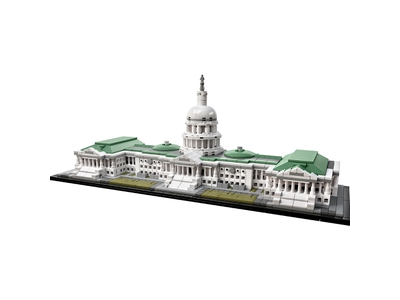 The United States Capitol Building (21030) Lego set is available from the sites below. However, they do not offer delivery to your selected region. The United States Capitol Building (21030) Lego set is no longer directly available from the sites below. However, 3rd party partners of these sites might still have the set available. Alternate description Explore iconic architecture with this LEGO® Architecture interpretation of the United States Capitol Building with detailed neoclassical facade, dome, steps and lawns. LEGO® Architecture interpretation of the real-world architectural landmark, the United States Capitol Building. Features the Capitol's neoclassical façade, dome, colonnades, north and south wings, steps and lawns. Remove the dome to access the rotunda, featuring columns, 8 statue elements and a tiled floor. The included booklet contains information about the design, architecture and history of the building. This set includes over 1,000 LEGO® pieces. The scale of this model matches the LEGO® Architecture 21022 Lincoln Memorial. Measures over 6” (16cm) high, 17” (44cm) wide and 5”(14cm) deep.